Wildlife Friends Foundation Thailand’s mobile wildlife clinic not only goes out and rescue wildlife in need of help to be treated at the WFFT hospital, but they also go out to check out and treat wild animals kept at temples, private homes and other locations - "We do not agree with the keeping of wildlife elsewhere but at least can improve the lives of these wild animals before they can be moved to better places or are being rescued". Bears and other wildlife are being "donated" by some people to temples in Thailand, and sometimes bought by temples as mini-zoos. It is illegal, but it has been practice for many decades as temples are "sacred" places. It is the job of the authorities to take in these animals, but sometimes they neglect their job and leave the animals to suffer a long time. 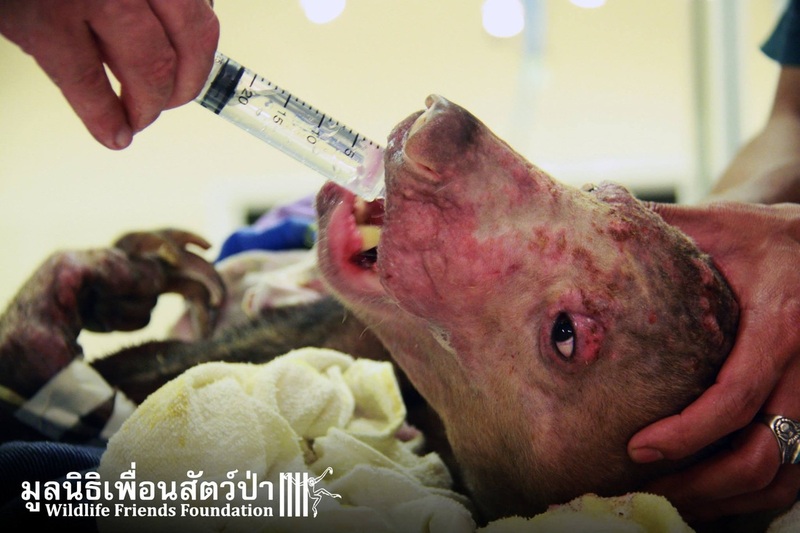 In the case of Kwan, the Wildlife Friends Foundation Thailand (WFFT), came too late - the poor bear was severely malnourished and neglected - Kwan got love and compassion from kind people her last day in life, thanks to this organization and its aides - please visit and support WFFT, who work tirelessly for the wild animals in Thailand - website and fb page. 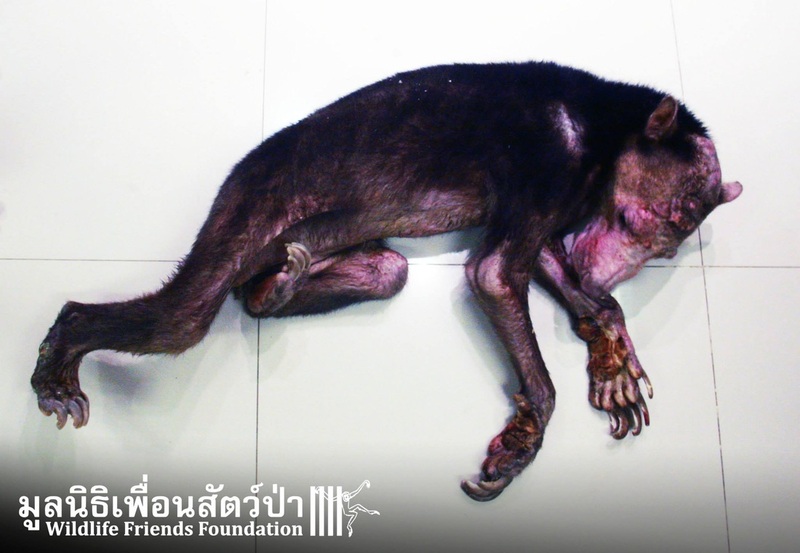 On one of our check-ups on wildlife at temples and private homes around Thailand we found a 3 year old Malayan sun bear inside a dark room, kept at a temple. 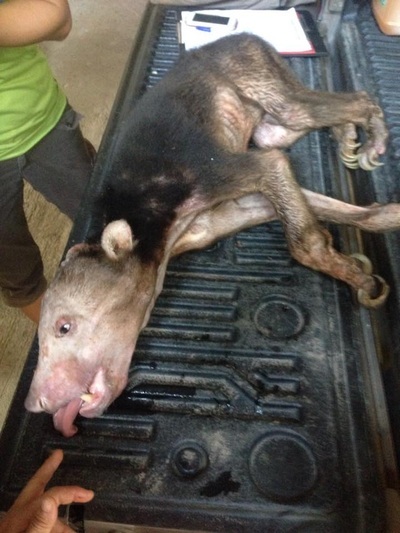 The bear had been in the room for so long, without any sunlight, that it got weak,, skinny and lost almost all hair. The WFFT wildlife rescue team begged the owners to give up the poor bear so it could be taken to the WFFT hospital for treatment, to save it’s life! 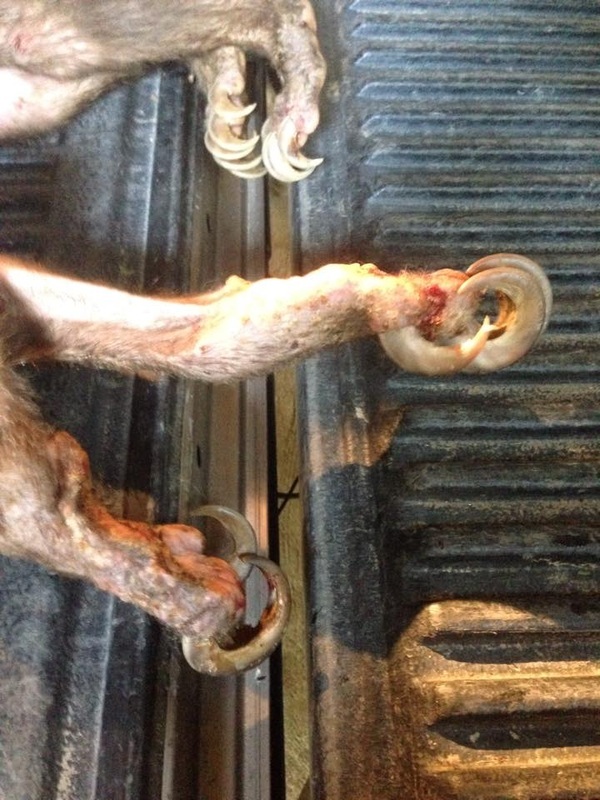 At 4 PM on Saturday 14th of March we were able to remove the bear from its ordeal and we started the long trip to our centre, arriving around 7 at night. Since arrival we have been fighting to keep the bear alive as it is too weak to eat and has a very low body temperature. Most people will not recognise a bear in the photos, neither did we at first. We are doing all we can to rescue this bear right now. 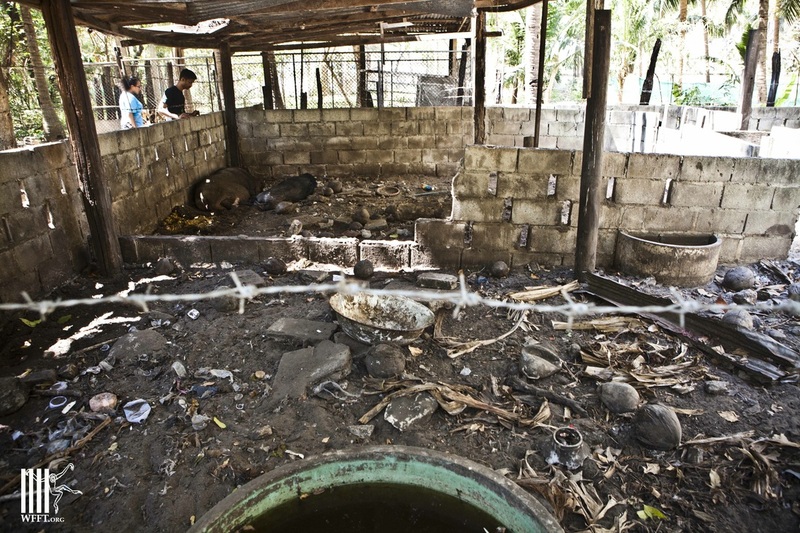 WFFT team visit temple and finds the 4 bears still in the cages that are extremely dirty with rotten food inside. 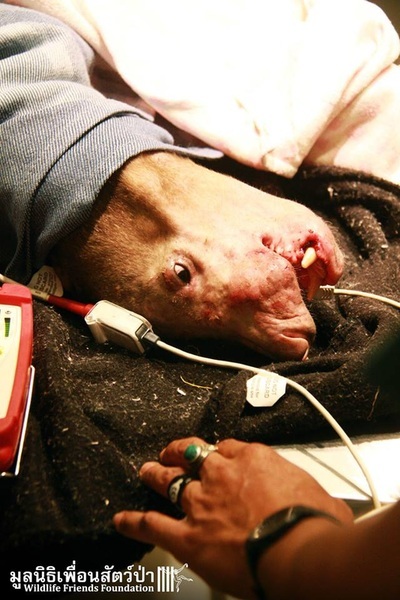 One bear is seriously ill and needs urgent treatment. 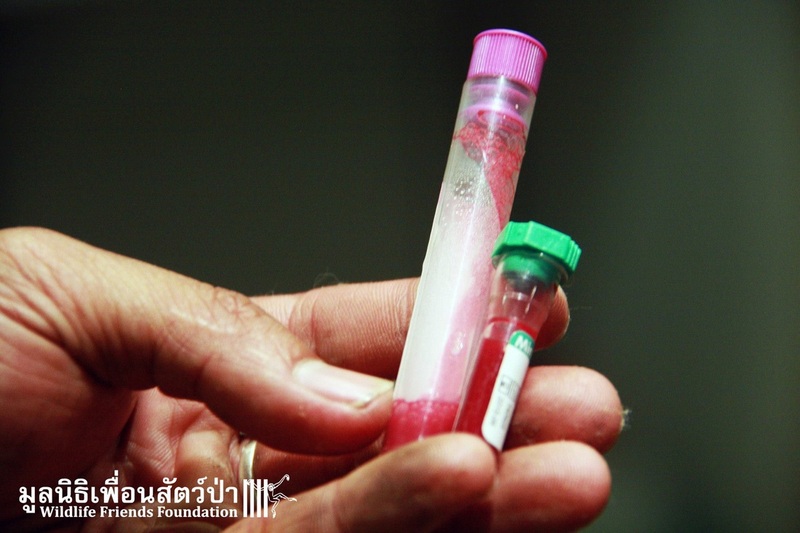 After talks with monks and staff they will allow treatment, but claim bears are confiscated by DNP and we can only treat with their permission. Permission granted by phone late afternoon. 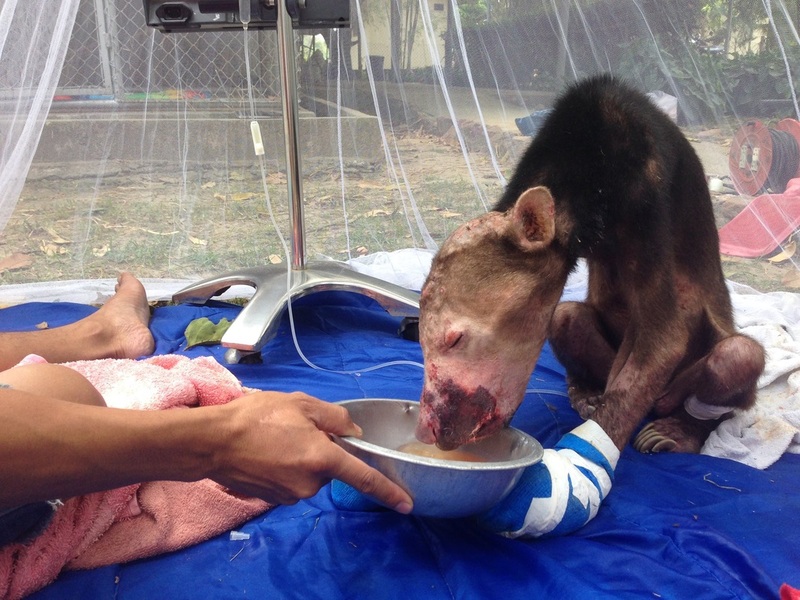 Edwin hears sound of a Malayan sun bear inside a building. Staff at temple tell later there is a 3 year old bear in one of the rooms. Not seen on this day. 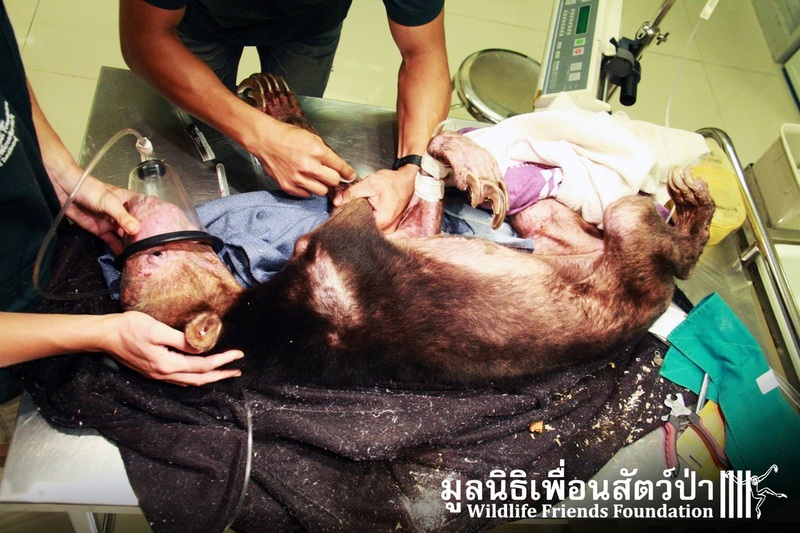 WFFT mobile wildlife rescue team travels with full gear for treatment to temple, treats 2 sick bears. Both need to be sedated as one might attack staff if other is sedated or taken out. 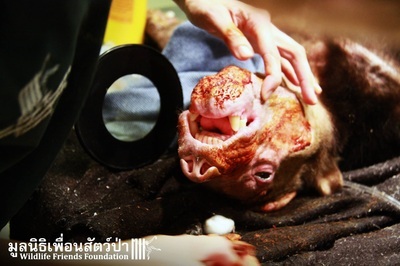 Sedation and treatment takes over 4 hours, meanwhile cage is being completely cleaned and disinfected by WFFT caretakers. 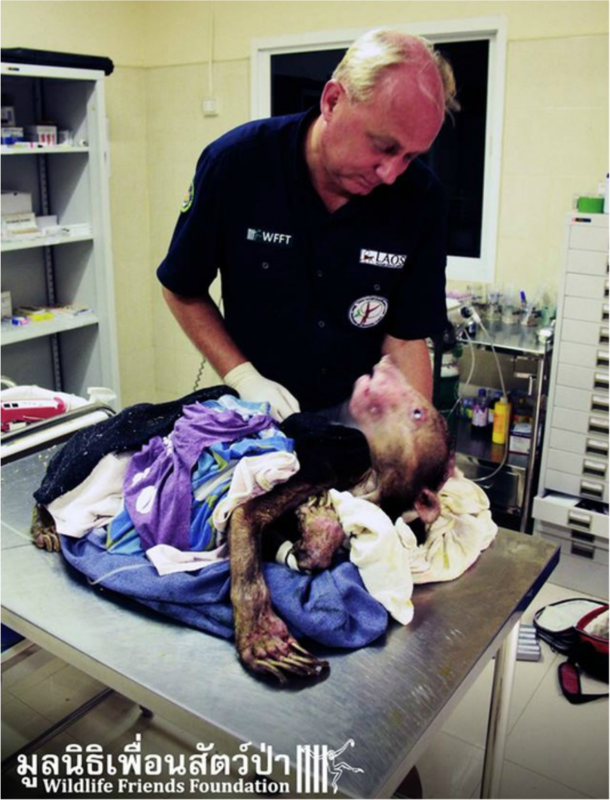 One of the nurses takes Jansaeng (Noi) of WFFT into a building and finds the sun bear inside a dark room. 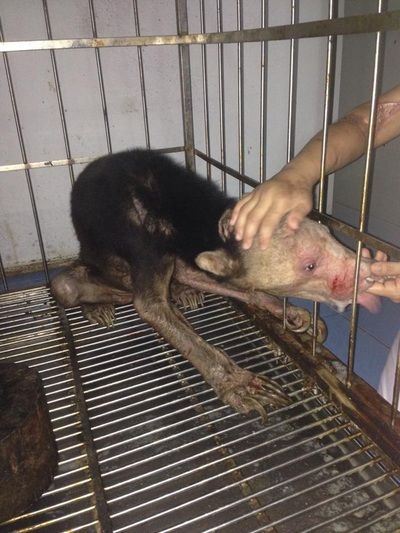 The sun bear is very ill and can hardly walk, she is literally skin over bones and needs urgent care, but team feels we might be too late to safe her. 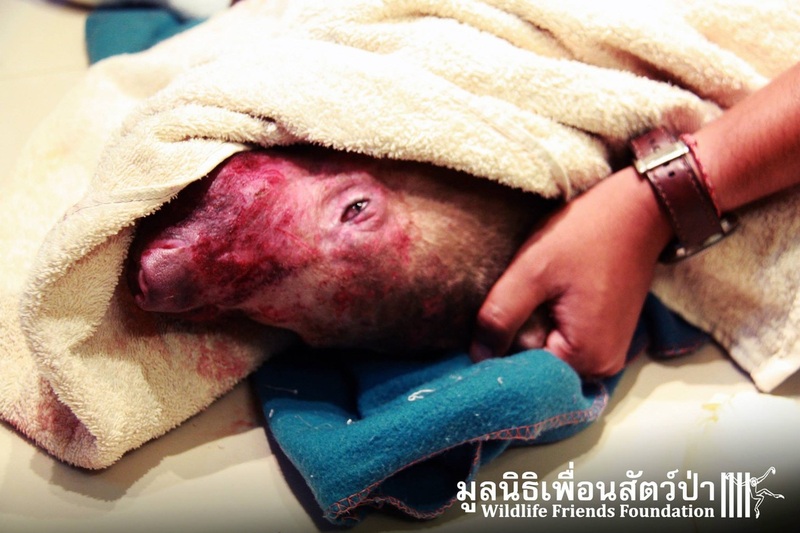 As the little bear is surely not going to make it at the temple we decide to take her to WFFT wildlife hospital. 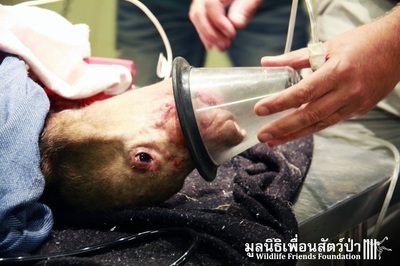 On arrival at WFFT the bear is recovering from anaestiesa but show signs if stress and weakness. She is put under intensive care. During the whole day the bear that is named “Kwan” is being treated and supported but she gets weaker and weaker. Kwan stopped breathing twice and was put back up again, but finally passed away at 14;45hrs. WFFT in touch with DNP head-office to ask for urgent rescue of the remaining 4 bears. 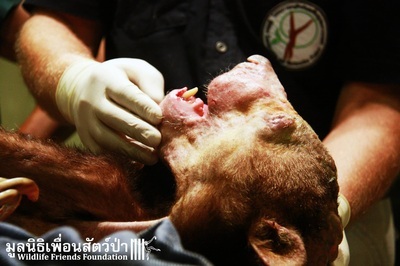 WFFT team on the way to temple for further treatment. At this moment 2 of the 6 bears have died and one is still struggling to survive. 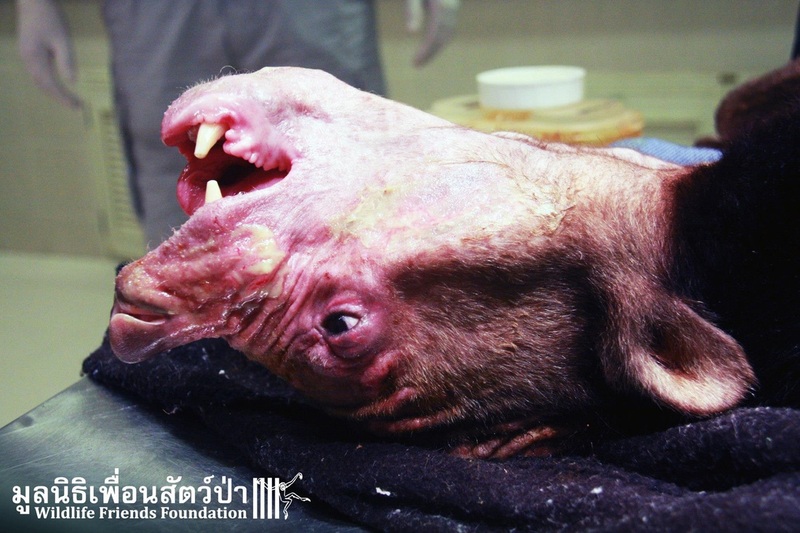 “Why are some people immediately prosecuted and animals confiscated from them even if they are in good care, and others can keep the animals and are not prosecuted at all?" Bottomline is; why did it take 3 years to act on this issue? 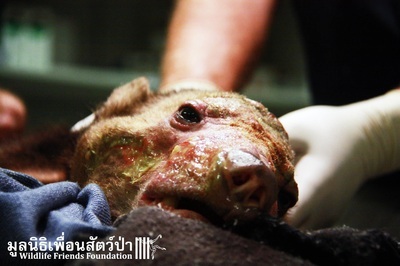 “Kwan” the little bear we rescued yesterday has been fighting for her life the last 24 hours. 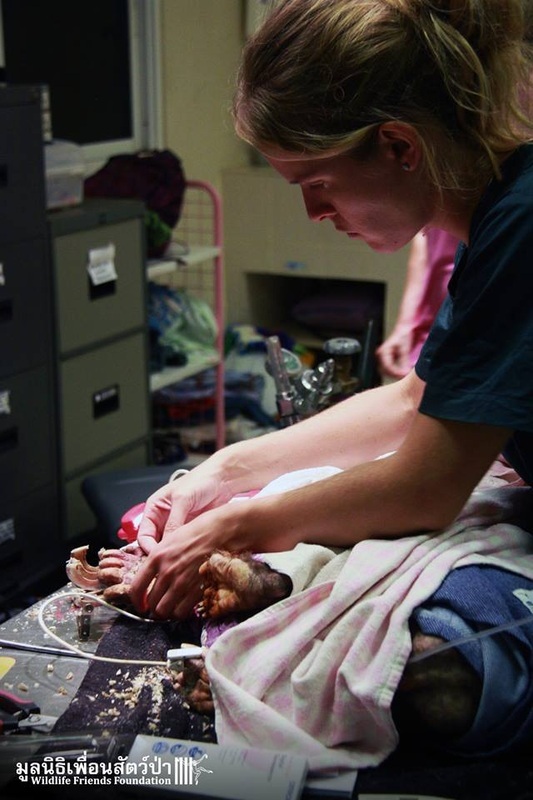 We have done all we could to keep her with us. She went down three times today, stopped breathing, but we got her back up again, hoping and fighting for the best. 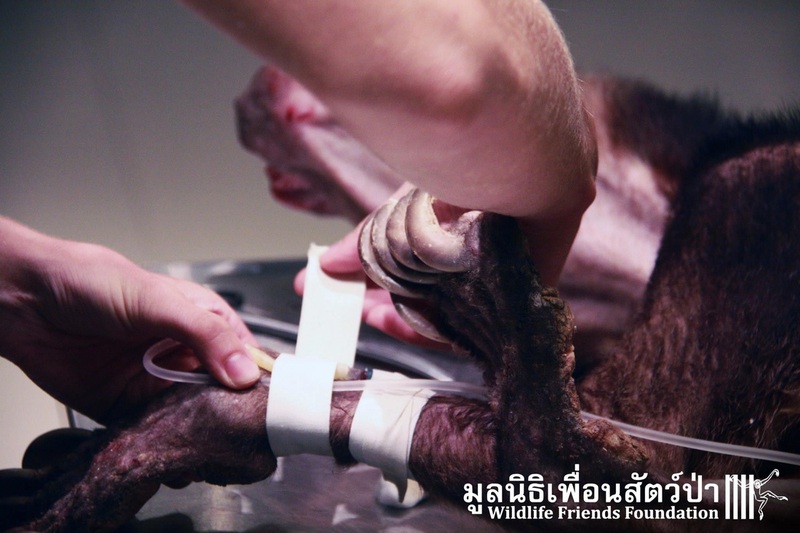 Kwan passed away at 14:45 Thailand time. We are all devastated of this loss, wish we had better news.